Who knows why our cheesecakes crack. Lots of factors but no matter because it still tastes decadent for that special treat!!!! 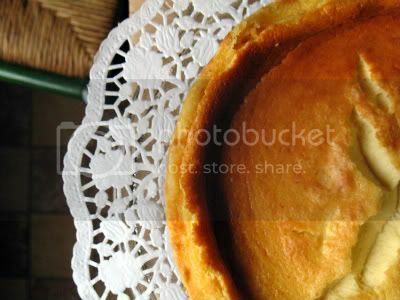 I recently heard that baking your cheesecake with a little water in another container helps to reduce the top from cracking. I haven't tried it, but it certainly is worth a try. Your cheesecake sounds divine by the way. Sylvie that really does look like the worlds best cheesecake! Total yum! Send a slice my way! Have a great time in New York. Im so jealous. Take lots of pics of all the food to show us when you get back! Gorgeous. Why do cakes always look so much more delicious sitting atop a doily? hate it when it cracks too.but I'm fine as long as it tastes good! Sylvie, have a great time in NY. I love cheese cake. There is a little trick to prevent cracking. Bake for 15 minutes, than take out and let stand for 10 minutes. Then bake until cake is done. I have tried it once and it worked. But more often I'm too lazy and let it crack when it likes to crack. Who cares? 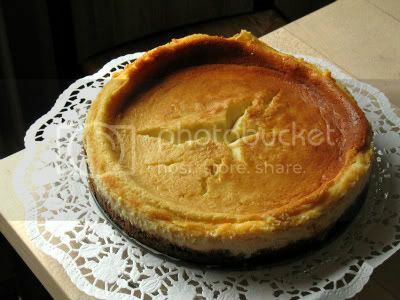 I love cheesecake and this one looks fab! I've had a lot of trouble with cheesecakes cracking too, the good news is that they still taste really good! can you please let me know if there is any substitute for eggs? i'm allergic to them. Shruti, thanks for your nice comment. I'm afraid I'm not aware of egg substitutes, but that doesn't mean that there aren't any. Maybe you could google it!